You silly sovereign CDS holders thought you had something of value didn't you? I'm so sorry, the appropriate instrument for today's "event" is the CHS - Credit Haircut Swap. Credit Default Swaps on sovereigns are worthless. Thanks for the risk-less cash flow though, piggy. from the over-indebted nations whom they just gave money to. Get it? 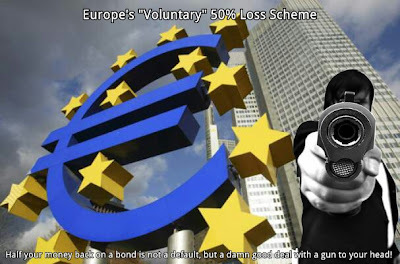 As a result of labeling 50% haircuts "voluntary", Credit Default Swap contracts have proven to be useless when it comes to protecting against sovereign default. The serious implication is investors will need to find another way to hedge. In yet another stunning "agreement", this will somehow not trigger credit default swaps - in other words, they're not really default swaps any more, now they're "whatever we call thems when we want them to be whatevers." The big question–apart from how many investors they will get to go along with this, given that they couldn’t reach their target of 90% investor participation when the write-down was only going to be 21%–is whether this will trigger a CDS pay-out. That this is even up for discussion is mind-boggling. These credit default swaps are meant to be an insurance policy in case Greece doesn’t pay the agreed upon interest and return the full principal within the agreed timeframe. If they don’t pay out when bondholders are taking a 50% hit then what’s the point? I call shenanigans. It's a political judgment: the institutions who were long CDSs were more expendable than those who were short CDSs. If you're playing in this rigged game and you don't own the politicians, you're doomed. Can't wait for a North American Union.